Eating Disorders are a range of complex conditions relating to persistent eating habits and behaviours that impact negatively on an individual’s health, emotional wellbeing and capacity to function in everyday life. They relate to a disordered relationship with food and ongoing severe concern or distress about body shape or weight. Eating disturbances may include inadequate or excessive food intake, either of which can, not only ultimately damage a person’s well-being, but which if persistent or untreated, can be life-threatening or carry long-term health risks. Eating Disorders can affect both females and males and they can often co-exist with other conditions such as anxiety disorders, depression or substance abuse. Eating disorders are treatable however the symptoms and consequences, if not addressed, can be detrimental or even deadly. Research has shown for example, that Anorexia Nervosa has the highest mortality rate of any psychiatric disorder (Arcelus, Mitchel, Wales & Nelson, 2011). It is a life threatening disorder due to the the effects extreme weight loss and starvation have on the body and the brain. Repeated vomiting, associated with Bulimia, can cause esophageal damage, electrolyte imbalance can damage the heart and significant dental damage can develop as stomach acids erode tooth enamel. Binge eating can cause long-term health issues such as obesity, diabetes, high blood pressure and heart disease . The reasons behind the development of Eating Disorders can differ but are thought to include a combination of environmental, social and cultural factors and can also involve some element of genetic disposition. Cultural attitudes have a significant effect on how we view our bodies and what is considered to be ‘perfect’ or ‘desirable’. Some aspects of current culture glorify thin women, and elsewhere there is a focus on BMI (Body Mass Index), and on ‘desirable’ levels of muscle mass. These can contribute to a disordered relationship with food, eating and exercise as we strive to achieve what has been put forward as ‘healthy’ or optimal. This can also make us dissatisfied with our own bodies and body shapes. For example a culture which values thinness or a particular body shape and can make those who don’t meet these supposed criteria feel undesirable or unworthy. Food and eating issues can therefore become an expression of ourself and our self-worth. Other reasons for individuals to develop Eating Disorders and deprive themselves of food and nourishment, eat to excess, binge eat or exercise excessively are out of feelings of anxiety, inadequacy, poor self-esteem, pressure to achieve, or the desire to please others who are important to them. People with eating disorders can often be highly sensitive and overly concerned with meeting the expectations of others. 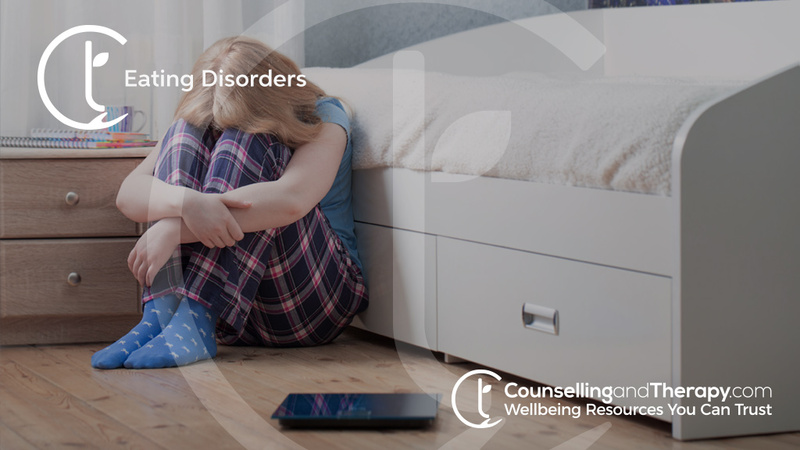 Eating Disorders can sometimes commence in teenage and adolescent years when identity is becoming a key issue and the opinion of peers is of huge importance. Anorexia Nervosa is characterised by extreme, restricted food intake that eventually causes dangerously low body weight. This intentional starvation can lead to malnutrition as well as other severe health risks. Those suffering from Anorexia Nervosa will have an intense fear of gaining weight even though they are already underweight. Also, they will be unable to accurately perceive their own physical appearance – this self perception of their own body will have become distorted and they will have ongoing obsessive thoughts about food and weight. Restricting: which includes restricting food intake, calorie intake, or other restrictions around food. Purging: involves a compensatory mechanism as a result of severe feeling of guilt following eating and can take the form of self-induced vomiting, intense exercising and use of laxatives, for example. Both types involve an irrational fear of weight gain and abnormal or dysfunctional eating patterns. Anorexia Nervosa is a serious disorder where the risks and potential consequences extend across both the social and physical aspects of life. For an Anorexia sufferer obsessed with food and weight, friendships and relationships decline in importance as their focus is elsewhere. For reasons including lack of energy and motivation there is a loss of interest in normal life and activities. These in turn create isolation and loneliness.. There is potential for serious physical harm and this can include functioning of major organs in the body, including the heart. Bulimia is characterised by binging, which is ingesting an abnormally large quantity of food in a short period of time. It is often followed by purging what has been eaten in order to avoid gaining weight. Purging is the name given to the inappropriate compensatory behaviours of trying to undo or get rid of food consumed while binging. Methods of purging can include forced vomiting, use of laxatives and diuretics or extreme exercising all driven by an attempt to avoid gaining weight from what has been eaten. With Bulimia, the bingeing can create a feeling of loss of control, followed by guilt or self loathing with purging reflective of frantic efforts to undo both the feelings and the effects of binge eating. One of the most common and detrimental side effects of Bulimia however is dental damage as through the repeated act of self-induced vomiting teeth are subjected to continuous and seriously erosive stomach acid. Binge Eating Disorder is characterised by the consumption of unusually large amounts of food and feeling a loss of control and an inability to stop eating. Those suffering from Binge Eating Disorder may binge eat even when not hungry and continue to eat long after they are full. They may feel extremely distressed during or after eating but still feel powerless to stop. During a binge, eating may take place so quickly that food is barely being registered as being eaten and is often not even tasted. With Binge Eating Disorder there are no compensatory behaviours or attempts to ‘make up’ for overeating and many people with this disorder are overweight or obese. Binge eating can form a cycle in that the eating is comforting for a very brief period and eases or ‘stuffs down’ unpleasant emotions like anxiety, stress or depression. However, it is often followed by feeling of regret, guilt and self-loathing. Weight gain and obesity associated with this type of overeating can compound negative feelings about appearance and the self, and food continues to be used to cope and in an attempt to feel better. People can and do recover from Eating Disorders. When considering the treatment and recovery from an Eating Disorder it is important to remember that although behaviours are centred on food, they are not primarily about food. Eating Disorders are about how an individual sees themselves and how their self worth is, for them, connected to their physical appearance. Their self image has become distorted and their eating behaviour has then also become disordered in an attempt to correct this. True happiness and self esteem come from loving oneself and the road to recovery is about taking steps towards self acceptance and learning to listen to one’s own feelings and to one’s own body. The first step on this road is if for a person to acknowledge that they have a problem and that what they are doing to themselves is destructive. This may be difficult as they may have feelings of shame, guilt, self-disgust, fear, or feel helpless to either continue with the behaviours or let go of them which may also be terrifying. Behaviours around Eating Disorders can be very embedded and although they are a destructive coping mechanism they will have played a significant role in person’s life in helping them feel or safe or in control when faced with overwhelming anxiety or distress. Effective treatment for Eating Disorders includes a number of aspects – physical, behavioral, emotional and psychological. Recovery is about learning healthier ways to cope with difficult feelings, developing a better relationship with food and nourishment for the body and also importantly involves recovering a sense of oneself which includes self acceptance and self love. A high level of personal commitment as well as appropriate treatment is needed in the recovery process. Due to the complexity of these conditions, treatment of Eating Disorders can sometimes involve a broad team of specialised professionals including GP’s, specialised support groups or organisations as well as counselling and psychotherapy. Counselling and psychotherapy can be of significant help in the treatment of and recovery from Eating Disorders. Evidence has shown that early identification and treatment can greatly reduce the duration of severity of Eating Disorders and therefore it is important to seek professional help as soon as possible. Bodywhys – the national eating disorder association of Ireland. The Rutland Centre – Based in Dublin. Eating Disorder Centre Cork – Based in Cork and offering specialist out patient treatment. Lucena Clinic Services – providing mental health services for children and adolescents. St Patrick’s Hospital – Services in outpatient, day patient or inpatient settings. St John of God Hospital – Based in Dublin offering both inpatient and outpatient services.